Michael Jack, whose personal Flickr website is a member of our Hall of Fame, is a collector of vintage transistor radios. Perhaps you recently saw a picture of a cool looking pocket radio from the early 1960’s and were reminded of your carefree, youthful days? Maybe it was the pastel colors or atomic aged designs that caught your eye? Or the chrome highlights that attracted your attention? Nonetheless, you find yourself actively seeking them out at the local flea market or surfing eBay for a good deal. Well, be warned! If you buy one transistor radio it will most likely grow to two, then three. By your fourth radio you will be considered a “collector” and will be hooked! There will be no turning back from the appeal of these mid-century, technical and artistic marvels. Before spending too much money I recommend you take some time, do your homework and educate yourself. Then have fun and collect what you like. Although the main focus of this article is to broaden your knowledge base, make sure you don’t just collect for investment or get caught up in only possessing what are considered “must haves”. Sure, you’ll want some key radios but make sure you collect what you like. Have fun and buy radios that appeal to your personal tastes. I suggest spending some time on the internet or scanning the pages of the few transistor radio price guides to research makes and models. Most of the price guides on the market were released well over ten years ago during the first “wave” of transistor radio collecting. They predate eBay and the quoted prices are often higher than present day values. What we’ve realized over the years is that these radios are not as rare or scarce as once thought. There are a few exceptions which I will talk about shortly. To counteract the potential for a Russian air attack on North America the US Government enacted the CONELRAD program, which stood for CONtrol of ELectromagnetic RADiation. CONELRAD established two civil defense frequencies, 640 and 1240 kilohertz. During times of emergencies, all stations except the CONELRAD stations at 640 and 1240 AM would cease operations (note that some Japanese radios made by Sharp and Hitachi during the late 50’s left out the CD marks). American companies were the first out of the solid-state-radio gate with the release of the Regency TR-1 on Oct 18, 1954 (it sold well into 1955 and 1956 as the re-designed TR-1G and TR-4). 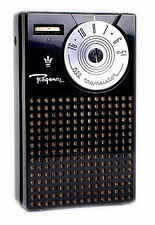 As a transistor radio collector I think it’s important to have one example of this historic radio in your collection. They can be found on Ebay ranging in price from $300 to $1000 depending on color. The more basic ivory and grey cabinets will fetch less money than the “mandarin” red and black. For a brief period TR-1s were released in very attractive pearlescent pink and light blue colors as well as swirled, jade green and mahogany. These later examples command top dollar on Ebay. If you really want to find a great deal on a Regency TR-1 I suggest frequenting your local flea markets, garage sales and antique markets. It may be a few years until you find one but think of the fun you’ll have searching and the money you’ll save. I found a red TR-1 at a flea market two years ago and only paid $100. The TR-1 and TR-1G used an odd 22.5 volt battery which can be found in limited quantities today but are pricey. Early Zenith radios like the Royal 500 series are also worthy of having in a collection. The first Royal 500 was hand wired and had a metal chassis! The fifth generation Zenith 500 was the 500H. It has a large oval speaker and is considered to be the best sounding/performing portable transistor radio ever. If you’re into high performance you may want to consider this one. An early handwired 500 will fetch more money than the later versions. Other collectible American-made radios are from RCA, G.E., Admiral, Motorola, Magnavox, Philco, Raytheon, Arvin, Sylvania and Emerson etc. American made radios tend to be slightly larger than their Japanese counterparts. Most U.S. radios would be considered “coatpocket” sized – too big for your shirtpocket but too small to be classified as a portable. Many were also larger, leather-clad portable sets like the Zenith Royal 750 and Raytheon 8TP-1. One of the most popular and attractive coat pocket radios were/are the Emerson’s 888 series. Emerson released several models in this series from 1958 to 1960 such as the Vanguard, Pioneer, Explorer, Satellite, and Atlas – all named after various U.S. space programs. These radios can be found in great numbers today, and are terrific looking and often reasonably priced (typically from $20 to $100 depending on condition). Although Japanese manufacturers were a bit behind the American companies in producing transistor radios they quickly caught up and exceeded expectations. The first Japanese transistor ever released was Sony’s TR-55. At the time Sony was a brand name, the company itself was called Tokyo Tsushin Kogyo. The TR-55 is incredibly rare today. It was only sold domestically in Japan while 50 units were imported in Canada by General Distributors (GENDIS). You may never encounter one of these in all your years of collecting. The Sony radio that seemed to change the entire electronics world forever was the TR-63. Released in 1957, it was considered the world’s first, truly pocket-sized radio and was the first to utilize all miniature components. It was also the first Japanese radio to be imported into the U.S. (several other early Sony radios were sold in Canada in 1956). Several TR-63s appear each year on eBay but expect to pay top dollar for one. Even examples with cracks or chips can fetch $400. Those in mint condition will realize higher amounts. Once Sony opened the U.S. market, other names like Toshiba, Hitachi, Sharp, Standard, Sanyo, Matsushita (Panasonic), Mitsubishi, Aiwa, Realtone, Global, and Zephyr arrived on North American shores and attracted the youth market with their smaller, more affordable and more colorful pocket radios. 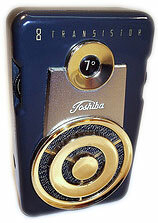 The simultaneous arrival of imported pocket radio and rock n’ roll conspired to change the electronics industry forever! By the late ’50s and early ’60s, many American companies had opted to have their radios made in Japan but retained their American brand names, such as Trancel, Penny’s, Channel Master, and Bulova. Even giants like Zenith, RCA, Motorola, Philco, and G.E. had their radios made in Japan. They could no longer compete with the lower prices and more attractive designs coming from Asia. One of the classic features of Japanese radios was reverse painted plastic. Reverse (back) painting was a very popular method of ornamenting transistor radios between 1958 and 1962. By painting all artwork on the inside of the clear plastic dial cover, there would be no wear or damage to the most attractive features of the radio. A smooth protective surface remained on the outer dial. This process also gave the radio a three dimensional appearance. The depth and palette of colors were quite breathtaking. Gold on white, black accents, bright red and powder blue along with geometric shapes like starbursts, chevrons, jet wings, diamonds and parallel lines make reverse painted radios visually stunning and highly sought after by collectors. Makers like Toshiba and Crown were exceptional with their creative use of reverse painting. TR-610 (which sold almost 500,000 units worldwide), with it’s sleek cabinet and round speaker grill, spawned a host of imitators like the Realtone TR-1088 “Comet”. These radios can be found in abundance today and range in price from $50 to $150 depending on condition and color. In your travels you may even encounter pocket radios called “Boy’s Radios”. Japanese firms were hit with both a domestic export tax and a North American import tax on any AM radio having three or more transistors. This would have put a dent in Japanese radio sales – forcing retail prices to climb. Solution? In the early 60’s Japanese manufacturers developed AM radios which could operate on only two transistors. They were marketed as “toys” rather than electronic devices thus stepping around the taxes! These radios would either have Boy’s Radio or Two Transistors prominently and proudly displayed on the cabinet. In many cases, the cabinets were identical to “real” radios with 6 transistors. Performance was less than stellar but these radios could still pick up local stations. Teenagers were swayed by price and appearance anyways, and performance was low on their list. Boy’s Radios show up often on eBay and range in value from $25 to $70. With any transistor radio from the 1950’s or early 60’s it seems that the brighter the color the higher the price. Cool 50’s shades like robin’s egg/powder blue, seafoam green and bright red or yellow command higher prices. Black and ivory cabinets are considered less attractive by some and may reduce a radio’s value on the collector’s market. Of course condition is key in valuing a radio as well. Finding a radio with its original box, leather case, earphones, owner’s manual and warranty card/sales slip will inflate it’s worth. You may have to dish out twice or three times a radio’s book or eBay value with all those extras. Be sure to examine the cabinet closely when making a purchase. Small hairline cracks or chips are often found in the corners. 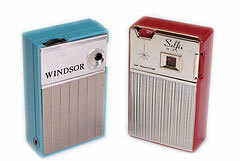 These pocket radios experienced very active lives during the 1950’s and 60’s. Many were taken to picnics, ballgames, schools and other social outings. They might have been dropped, left in the sun, damaged while trying to replace the batteries or just plain neglected by their owners. Some collectors refuse to buy damaged radios. Others, like myself, are not troubled by buying less than perfect examples. The time spent restoring and repairing is very rewarding and it’s much easier on the pocket book! (A damaged radio will most often realize half of its book or auction value) There are several products on the market like plastic repair kits, polishes, cleaners and electronic replacements to bring a radio back to life if you so desire. If you want to keep a radio historically accurate, I recommend not changing its electronic components….the choice is yours. Radios made in Hong Kong during the mid to late 60’s are not highly desirable. 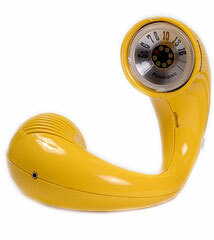 Gone were the fancy colors, atomic age designs, chrome and reverse painted dials. In my travels I’d say that over half of all the radios I encounter were made in Hong Kong. Most often I pass them up unless the price tag is $5 to $10. Perhaps in another ten years these radios will become “collectible.” However, if you see one and you like it….buy it and enjoy it! During the 1970’s, radio design experienced a renaissance. Bright colors and cool shapes made a comeback (perhaps inspired by disco, mood rings and the excesses of the decade). Panasonic released several radios that are highly collectable today such as the Panapet and Toot-A-Loop. They can be found at flea markets or online auctions ranging in price from $10 to $50. Be prepared to spend more if you find one in it’s original box. 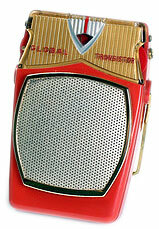 For Christmas in 1961 I received a GE 7 transistor coat pock radio made in New York State. It used a round 9V battery. Being totally blind it’s difficult to further describe it, but it said GE Deluxe 7 transistor on the front, with I believe silver coloring bordering the nominal tuning dial directly tuned from wheel. There were a few neighborhood kids with various GE models and they all received mubh better than anything our family had. So I sorta uh kinda uh hounded my dad about the good GEs. So, before zI could (was allowed) to open the box, my dad leaned so he couldn’t be overheared and said “it’s a damn GE.” Finally bottom line I’m looking for one. Could you possibly help me identify by model number or any means so I can look for one? I cannot find any info on an “Audition model 8F3” transistor radio. Sticker says made in the Philippines. It has AM and FM bands. Having been interested in radios for a very long time now .I have now got over fifty of them in my bedroom . I cant resist buying them So i guess i am hooked. I have one particular one . channel transistor type 30. marked CHANNEL SOMERSET ENGLAND . it is a wonderful little radio .bud no doubt could not compete with cheep Japanese products . I came across a Bunasonic radio (not transistor) so not sure if you can help me. I found a video on Google stating it was made from mid to late 60’s. Any info on where? And is there any value to these radios. It measures approximately 10″ tall by 6.5″ wide with a black faux leather case. The radio works very well and is in beautiful condition minus the tip of the antenna missing. Any info or value would be appreciated. I can’t find much at all on this. I have a Silvertone 6 Transistor radio. It takes battery 6422 which is 9 volts the length of a AA, and slightly larger in diameter. Does anyone know where a battery of this description may be purchased? My Mother had a Silvertone and that round 9v battery was hard to find even back then. There is room enough in the battery compartment for a standard rectangular 9v battery. Hi there! My parents had an old Audition transistor radio…the one that is built into a wood cabinet and the entire thing is made to look like an old fashioned, Early American style wall telephone. The radio does not go on, but I am quite sure it would work again for someone who knows some basic tinkering skills. There is a little wood wear to the bottom inside of it, the phone “cord” has a little fraying on it, and the phone “earpiece” has some paint wear on it. Other than those things, the entire thing is in overall pretty darn good condition. Do you know approximately what this would be worth? Thank you so much. Dear Michael: When being raised in Peoria, Illinois, I saved up my allowance to purchase my first shortwave (3 band portable radio by YORK). The year had to be circa 1964 or 1966. It was a beautiful radio that I pined for for months as a model sat in a glass enclosed retailer in the neighborhood along North Prospect Road. It had a beautiful red rock like emblem on the lower left side of the speaker’s grill with its rather large name print of YORK. I was more pleased when I got it home to find, that at night, it easily picked up international cities like Moscow, Rome (Vatican city), China, Vietnam, Australia, New Zealand, Yugoslavia, London, Iceland, etc. Michael, I do have one question. There were stamps inside the radio that clearly said: MADE IN JAPAN. But YORK, is it not derived from the old city of York, England? So, is this a case of an English or American company using the cheaper labor of Japan? I have a P1758 GE AM transistor radio still in box and a gray RCA stolid state transistor radio. What should I sell them for or just throw them away? 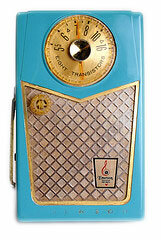 I have a federal BLUE transistor radio in the box excellent condition, model no.004 works well. Value / idea! Wanted: Any info on a Philco Ford All Transistor wooden radio. Model R-979. It has pug ins for tapes & phono . Speakers on each end, 23 1/2 L.
i have a Windsor Transistor Radio- model 2628 AM/FM and i cannot find any information on it—-can you please help? any idea the value of a “world-tone 8 transistor radio…model HR-802″…in original unused packaging and box. Also, the brown leather case and earphones w/case and a battery!!! I have a Philco Transistor with the leather carrying case and strap in mint condition. Does anyone know where I can get the equivalent for the Mercury Cell Type P-640 batteries? It takes four and they looked like large hearing aid batteries. 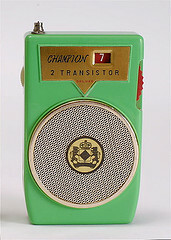 Does anyone have any info on a “IVY LEAGUER” 7 Transistor Radio any info would be greatly appreciated. when i was a kid in the 1970s i had a small am/fm radio that looked like a plain black plastic box when it was closed. you slid it apart to open it so you could see the dials and speaker. never been able to find anything similar and don’t know any details about it. my dad got it at some shop on canal street in new york. any idea where i might be able to find one? i’d love to get my hands on one some day. many thanks! “ ” By San Francisco standards, Singer was kind of a square.